Taipei, Taiwan – January 13, 2015 – Since established, Thermaltake group has kept on continued progress and has became globally famous for its innovative aesthetic engineering. In 2014, Thermaltake received many honors from worldwide, and the year-end Thermaltake is continuing a tradition with its win in the “Golden Pin Design Award 2014” with its three brand － Thermaltake, Tt eSPORTS and LUXA2! 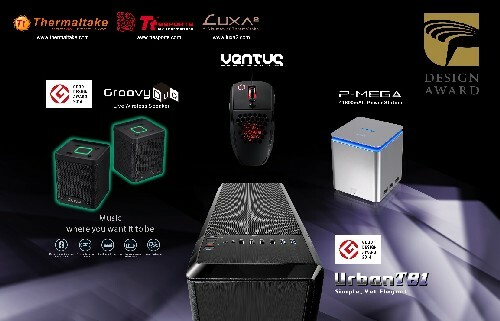 As such the jury of experts have paid tribute to exceptional position of four models from Thermaltake, Tt eSPORTS and LUXA2 stood out in particular : Thermaltake Urban T81 Full-tower Chassis, Tt eSPORTS VENTUS Ambidextrous Laser Gaming Mouse, LUXA2 Groovy Duo Live Wireless Speaker and P-MEGA 41,600mAh World’s Largest Power Station reached the high screening policy of Integration, Innovation, Features, Aesthetics and Communication and explode into prominence from 1,901 entrants from Taiwan, Hong Kong, Macau, China, Singapore, Malaysia, Australia, and the USA. According to the jury, Thermaltake products reveal extraordinary innovation function and style, showing renewable and user interface design to amaze the market! As a result of the “Golden Pin Design Award 2014”, Thermaltake has now succeeded in maintaining its place on the list of winners of its prestigious competition for the 5th time.. Chosen as one of the winners in “Communication devices/equipment for individuals or home” category of Good Design Award 2014, Thermaltake presents an elegant, high-impact and beautifully architecture design with the Urban T81 Dual Swing Door Full-tower PC case to provide enthusiasts with the ability to build the highest performing systems. Inspired by automotive “suicide doors” , the T81’s novel door panels are an innovative and inspired design that sets it apart from any other chassis . Likewise, the front door panel’s brushed aluminum finish masks extrusive drives and devices, producing a unified aesthetic of modern sophistication. A highly customizable 5.25” & 3.5” drive bay enables users to freely interchange the 3.5” hard-drive cages to suit one’s need, or remove 5.25” & 3.5” drive bays to gain maximum interior space for maximum airflow or the addition of liquid cooling systems. The sleek, brushed aluminum I/O port section provides two of the latest SuperSpeed USB 3.0 ports, along with four USB 2.0 ports. The integrated fan hub and controller can easily manage the airflow of up to 10 fans at once. In addition, HD microphone and headset jacks are positioned for easy, direct access when needed. Urban T81 is built to optimize airflow as part of its fundamental design. Triple 200mm fans and a 140mm fan come equipped. It is the first chassis in the market that has the ability to house 4x 200mm fans, along with three more 120mm fans - allowing unrivaled airflow to protect your valuable components. 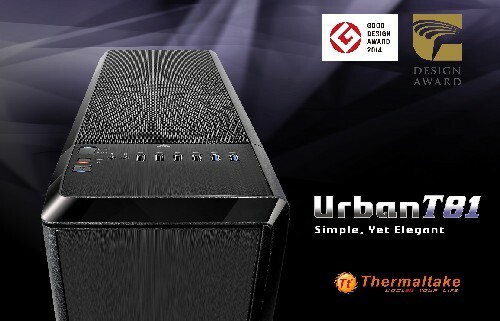 Urban T81 pushes the envelope by utilizing a high-end water cooling solutions. Featuring support for either front 360mm/top 420mm or front 420mm/top 360mm radiators, along with rear120mm and bottom 120/240mm radiators, the Urban T81 is an ideal chassis for extreme performance systems. Urban T81 Dual Swing Door Full-tower PC case also wins the Japan’s highly prestigious “Good Design Award 2014”. Tt eSPORTS VENTUS ambidextrous laser gaming mouse, designed specially to fulfill the needs of both left handed and right handed gamers, this gaming weapon is the ultimate tool enhance your gaming skills and place you at a perfect winning position. The symmetric shape of the VENTUS was carefully tuned in-house by Tt eSPORTS to offer a good grip for both palm and claw grip users, regardless of whether they are right or left handed. An AVAGO laser sensor provides 5700 DPI of precision, and OMRON switches are used as well for great durability and feel in clicks. A thumb button will be found on either side, which can be enabled/disabled at will through the mouse software. 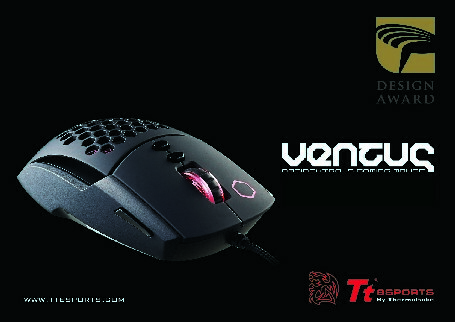 The VENTUS features 7 programmable buttons, with storage of up to 5 profiles, for a total of 35 programmable macros. Red LEDs in the hexagonal light up area of the left click, mouse wheel, and battle dragon logo further add to the gaming atmosphere. The honeycomb cut out design brings even stronger styling to the VENTUS, while at the same time facilitating the Air-Through Ventilation system of the VENTUS to keep the user’s hand cool while using the mouse. 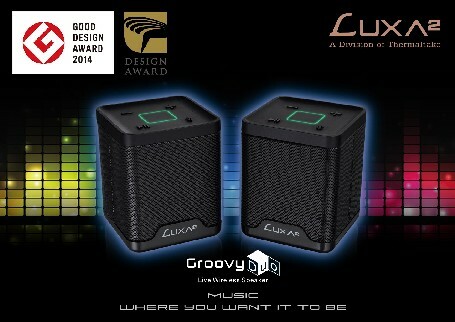 LUXA2 Groovy Duo Live Wireless Speaker is chosen as the winner in the “Electrical appliances for daily life, sound equipment” category of Good Design Award 2014. The Groovy Duo is a set of compact twin speakers that provides the most remarkable musical experience for all your lifestyle experiences. You can share your twin speaker with friends for mono to mono sound, or simply pair it up with its unique dynamic pairing mode for true stereo sound – watching movies, music and game playing, or even use as a mini home theatre system, the Groovy Duo compliments all your wireless musical needs. With its smooth black matte finish, crisp physical control functions and laser lined LED indicator, the Groovy Duo mixes hi-tech with hi-fashionistic appeal for the ultimate portable musical experience. One thing you must not do is mistake the Groovy Duo as an innocent looking little speaker as it is no slouch in the volume department, for it packs a whopping 6W (Watt) combined total audio output which is more than enough to keep that party going all night long. With up to 8 hours of long lasting playtime available, and requiring just 3 hours to recharge from flat, you spend more time jamming to your beats than anything else. The Groovy Duo is also compatible with LUXA2’s Groovy Audio Center App which features 5-Band Equalizer, Global Cloud Radio and Playlist library. The app is now available for download on the Google Play Store for those who fancy a more personalized musical experience. Play your music at the front, from the rear, side to side, above and below- the choice is yours. The Groovy Duo also wins the Japan’s highly prestigious “Good Design Award 2014”. 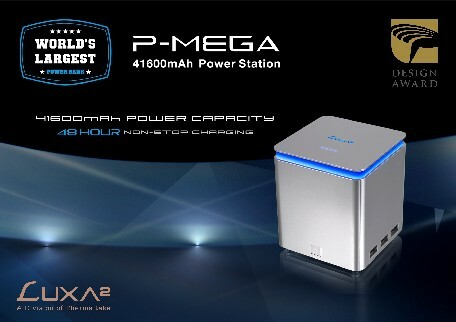 LUXA2’s P-MEGA possesses a titanic 41,600mAh battery li-polymer cell that can charge a device for 48-hours continuously. Not only is it powerful, it is also compact in size and easily portable. The P-MEGA possesses a whopping six USB ports to power six devices – smartphones, phablets, tablets – simultaneously and comes with charging indicators on each port to identify when a device is charging, and will automatically turn off when device is fully charged as to prevent overcharging and overload. In addition, the P-MEGA has three fast charging (2A) ports and three regular (1A) ports to solve your single charging socket problem. The P-MEGA has gone through rigorous testing and is fully FCC, CE and ROHS certified. What is even more unique is that the P-MEGA meets airline authority legal requirements of portable battery devices to be able to carry onboard flights. Thermaltake insists to provide the best to users from product, quality to service. Creating the perfect user experience is our everlasting persistence; developing innovative and user-friendly products with characteristic and distinctive design is our determination. “Golden Pin Design Award” gives Thermaltake more power to keep growing. Thermaltake will keep building a world-class cultural brand for the enjoyment of entertainment, e-Sports, technology and enhanced lifestyle choices to all users! The Golden Pin Design Award is an annual award that accepts entries from individuals or companies that are selling, manufacturing, or designing products or projects in a Chinese-speaking country or region. (International companies must have a subsidiary company or official dealer registered in a Chinese-speaking country.). Entered products and projects are assessed in three stages by an expert international jury. Second stage winners receive a Golden Pin Design Mark–an indicator of innovation that they can use to market their product or design project. Of these winners, just 15 to 20 receive a Best Design Award. All winners benefit from increased brand exposure through the public and media relations efforts of the Golden Pin team.